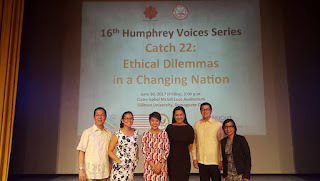 Humphrey alumni at the 16th Humphrey Voice Series in the Philippines (L to R): Arnel Jose Bañas, Criselda Caringal, Amy Avellano, Kimberly Esteban Molitas, and Nicolas Pichay. 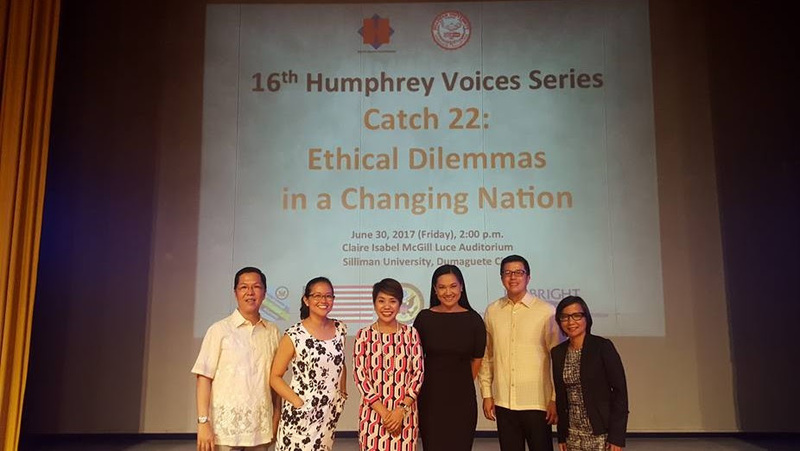 Five Humphrey alumni presented their lectures in Silliman University's 16th Humphrey Voice Series "Ethical Dilemmas in a Changing Nation" in the Philippines. Nicolas Pichay (Syracuse University, 2017-2018) spoke about "Discovering Ethics Hidden in Plain Sight," while Criselda Marie Caringal (Arizona State University, 2015-2016) discussed "Ethics in the Time of Trolls." Amy Alabado Avellano (University of Minnesota, 2008-2009) shed light on "Ethics and the Legal Profession" and Kimberly Molitas (University of Minnesota Humphrey School of Public Affairs, 2014-2015) talked about "Ethics in the Police Force." Arnel Jose Bañas (University of Washington, 2007-2008) served as the reactor. This was the largest Humphrey Voice Series to date, with 5 speakers and 700 attendees.